An eclipse refers to the complete or partial blocking of a celestial body by another body and can be used to describe a wide range of phenomena. Solar and lunar eclipses occur any time the Sun, the Moon, and Earth are all positioned in a straight line. This is an uncommon occurrence because the plane of Earth's orbit around the Sun is different than that of the plane of the Moon's orbit around Earth. Thus, the Moon is usually located just above or below the imaginary plane of Earth's orbit. Although the Sun is 400 times larger the Moon, the Moon is 400 times closer to Earth. Thus, when the Moon's orbit takes it in front of Earth, it blocks the Sun from view, creating a solar eclipse. During a lunar eclipse, the opposite happens: Earth passes between the Sun and the Moon, casting a shadow on the Moon. A solar eclipse is visible only during the day, while a lunar eclipse is visible only at night. Lunar eclipses are more common and last longer than solar eclipses, and can be viewed from everywhere on the planet at night. coincide only twice a year, signaling an eclipse season. Only during a small percentage of eclipse seasons do total eclipses occur. During a solar eclipse, the Moon's shadow sweeps across Earth. The shadow has two parts: the dark, central part called the umbra, and the lighter region surrounding the umbra called the penumbra. Those people standing in a region covered by the umbra witness a total eclipse; those in the penumbra see only a partial eclipse. Corona: The outermost atmospheric layer of the Sun. Lunar eclipse: Occurs when Earth passes between the Sun and the Moon, casting a shadow on the Moon. Penumbra: From Latin, meaning "almost shadow"; partial shadow surrounding the umbra during an eclipse. Solar eclipse: Occurs when the Moon passes between Earth and the Sun, casting a shadow on Earth. Umbra: From Latin, meaning "shadow"; the completely dark portion of the shadow cast by Earth, the Moon, or other celestial body during an eclipse. The type of solar eclipse depends on the distance of the Moon from Earth. The Moon's orbit, like Earth's, is elliptical (oval-shaped). At some points along its orbit, the Moon is closer to Earth than at others. In order for a total eclipse to occur, with the umbra reaching Earth, the Moon must be at a close point on its orbit. If the Moon is too far away, it appears smaller than the Sun and one of two things may happen. First, only the penumbra may reach Earth, creating a partial eclipse. The other possibility is that the Moon will appear to be centered within the Sun. When this occurs, a ring of brilliant sunlight, like a ring of fire, appears around the rim of the Moon. This is known as an annular (ring) eclipse. 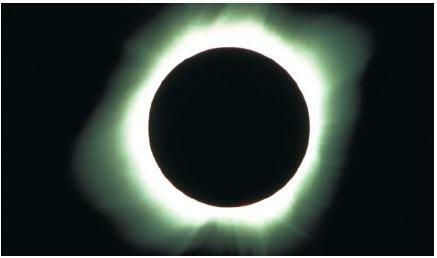 The first stage of a solar eclipse, when the Moon just begins to cover one edge of the Sun, is called first contact. As the Moon shifts across the Sun's face, the sky begins to darken. At the same time, bands of light and dark called shadow bands race across the ground. Just before second contact, when the Moon completely blocks out the Sun, a final flash of light can be seen at the edge of the Sun, an effect called the diamond ring. Then, at totality, all sunlight is blocked, the sky turns dark, and the planets and brighter stars are visible. During this period, the Sun's corona, or outer atmosphere, is visible as a halo. The weak light given off by the corona (about half the light of a full moon) is normally not visible because it is overpowered by the light of the Sun's surface. Prominences, jets of gas that leap from the Sun's surface, are also visible during the total eclipse. After a few minutes, the Moon begins to pass to the other side of the Sun, signaling an end to the solar eclipse. A lunar eclipse can occur only when the Moon lies behind Earth, opposite the Sun, and is fully illuminated. As the Moon crosses into Earth's umbra, it does not become totally hidden. The reason is that gas molecules in Earth's atmosphere refract or bend the Sun's light around the surface of the planet, allowing some of it to reach the Moon. Because the wavelengths of red light are refracted less, the Moon will appear various shades of red during a lunar eclipse. If the entire Moon falls within the umbra, the result is a total lunar eclipse. If only part of the Moon passes through the umbra, or if it only passes through the penumbra, a partial lunar eclipse occurs. A partial lunar eclipse may be difficult to detect since the Moon dims only slightly. Thank you so very much!!! This is so cool. I am going to show this to my little sisters who-by the way-are complete science geeks. I on the other hand am not but this is to cool for homeschool. This really helps! Thank you so much! I have been looking all over the internet for this!